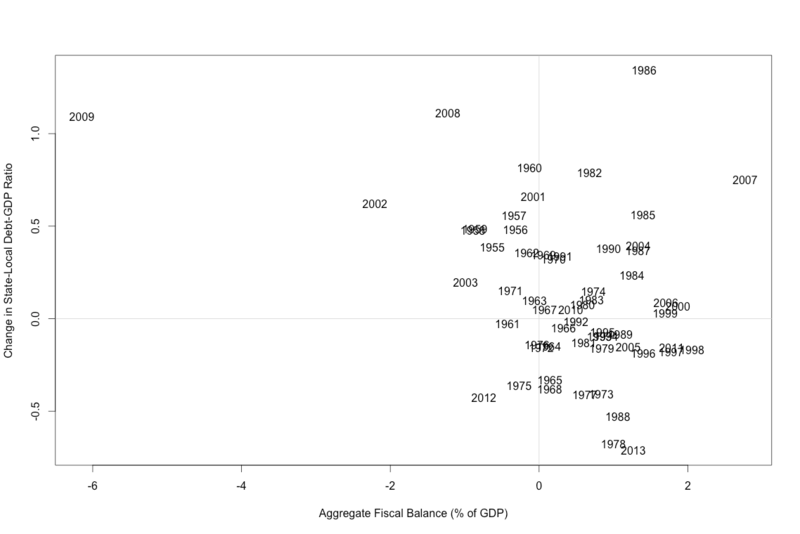 Despite statutory balanced-budget requirements, state budgets do show significant cyclical movement, from aggregate deficits of around 0.5 percent of GDP in recent recessions to surpluses as high as 0.5 percent of GDP in the expansions of the 1980s and 1990s (not shown here). Individual state governments show larger movements. Shifts in state government fiscal balances are accommodated almost entirely on the asset side of the balance sheet. 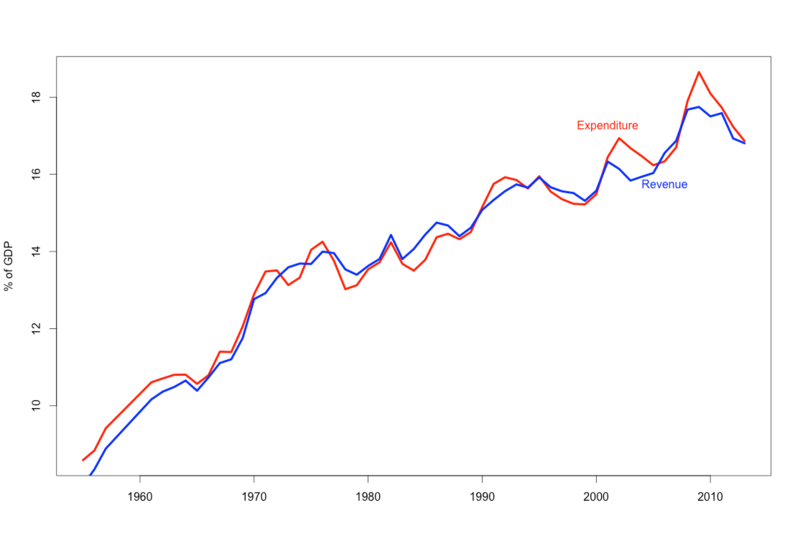 When state government revenue exceeds current expenditure, they buy financial assets; when revenue falls or expenditure rises, they sell financial assets (or buy less). State governments borrow in order to finance specific capital projects; unlike the federal government, they do not use credit-market borrowing to close gaps between current expenditure and revenue. (As I show in the paper, this is still true when we look at state governments cross-sectionally rather than aggregate data.) Between 2005 and 2009, state budgets moved from an aggregate surplus of around 0.3 percent of GDP to an aggregate deficit of around 0.5 percent. But borrowing over this period was completely flat – the entire shortfall was made up by reduced acquisition of financial assets. The ratio of state government debt to GDP rose over the Great Recession period, by a total of about 2 points. While this is small compared with the increase in federal debt over the same period, it is certainly not trivial. 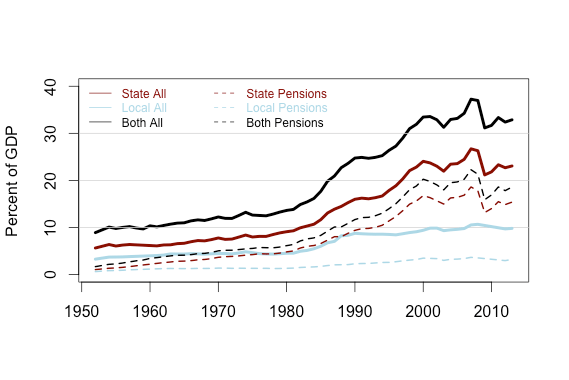 Among other things, rising state debt ratios have been used as arguments for austerity and attacks on pubic-sector unions in a number of states. But as we see here, the entire rise in state debt-GDP ratios over this period is explained by slower growth. The ratio rose because of a smaller denominator, not a bigger numerator. 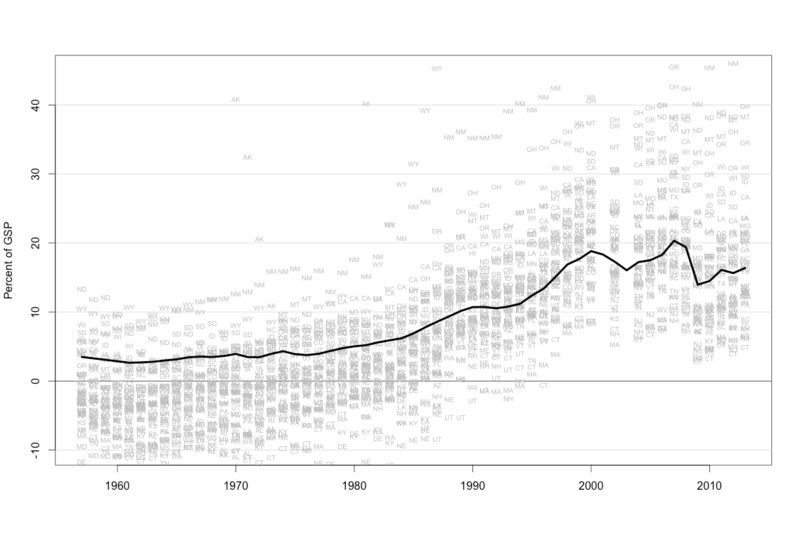 State debt ratios rose around the same time that state budgets moved into deficit. But there is no direct relationship between these two developments. Deficits were financed entirely through a reduction in assets. Simultaneously, the drastic slowdown in growth mean that even though state governments significantly reduced their borrowing, in dollar terms, during the recession, the ratio of debt to income rose. It is true, of course, that both the deficits and the growth slowdown were the result of the recession. But the increase in state debt ratios would have been exactly the same if state budgets had not moved to deficit at all. The pattern is similar in the previous recession. Although there was some increase in borrowing as state governments moved into deficit in 2002-2003, the large majority of the financing was on the asset side. The larger significance of all this, and the data underlying it, is discussed more in the paper. I will post that here next week. In the meantime, the two big takeaways are, first, that a lot of historical variation in debt ratios are driven by the effect of different nominal growth rates on the existing debt stock rather than by new borrowing; and that state governments don’t finance budget imbalances on the liability side of their balance sheets, but on the asset side. Let’s talk about state and local government balance sheets. Like most sectors of the US economy, state and local governments have seen a long-term increase in credit-market debt, from about 8 percent of GDP in 1950 to 19 percent of GDP in 2010, before falling back a bit to 17 percent in 2013. While this is modest compared with federal-government and household debt, it is not trivial. Municipal bonds are important assets in financial markets. On the liability side, state and local debt operates as a political constraint at the state level and often plays a prominent role in public discussions of state budgets. Cuts to state services and public employee wages and pensions are often justified by the problem of public debt, municipal bond offerings are a focal point for local politics, and you don’t have to look far to find scare stories about an approaching state or local debt crisis. The first thing to note about state and local debt is that, as the first figure shows, only about 40 percent of it is owed by state governments, with the majority is owed by the thousands of local governments of various types. Of the 10 percent of GDP or so owed by local governments, about half is owed by general-purpose governments (cities, counties and towns, in that order), and half by special purpose districts, with school districts accounting for about half of this (or a bit over 2 percent of GDP). This is interesting because, as the figure below shows, the majority of state and local spending is at the state level. This imbalance goes back to at least the 1950s and 1960s, when local governments accounted for just over half of combined state and local spending, but more than three-quarters of combined state and local government debt. The explanation for the different distributions of spending and debt over different levels of government is simple: While state governments account for a larger share of total state and local spending, local governments account for about two-thirds of state and local capital spending. In the US, most infrastructure spending is the responsibility of local governments; direct service provision, which requires buildings and other fixed assets, is also disproportionately local. State government budgets, on the other hand, include a large proportion of transfer spending, which is negligible at the local level. Since debt is mainly used to finance capital spending, it’s no surprise that the distribution of debt looks more like the distribution of capital spending than like the distribution of spending in general. This is an interesting fact in itself, but it also is a good illustration of an important larger point that should be obvious but is often ignored: The main use of debt is to finance assets. This simple point is for some reason almost always ignored by economists — both mainstream and heterodox economists regard the paradigmatic loan as a consumption loan. Among other things, this leads to the mistaken idea that credit-market debt reflects — or at least is somehow related to — dissaving. When in fact there’s no connection. For households and businesses, just as for state and local governments, the majority of debt finances investment. This means that additions to the liability side of the balance sheet are normally simultaneous with additions to the asset side, with no effect on saving. If anything, since most assets are not financed entirely with debt, most transactions that increase debt require saving to increase also. (Homebuyers normally get a mortgage and make a downpayment.) Sovereign governments are the only economic units whose borrowing mainly finances gaps between current revenue and current expenditure. Again, this point is missed as much by heterodoxy as by the mainstream. Just flipping over to the next tab in my browser, I find a Marxist writing that “Debt has become so high that the personal savings rate in the United States actually became negative.” Which is a non sequitur. The fact that most state-local debt is at the local level, while most spending is at the state level, is a reflection of the fact that debt is used to finance capital spending and not spending in general. But in and of itself this fact doesn’t tell us anything about how much changes in the state-local debt ratio reflect fiscal deficits or dissaving. It still could be true that state and local debt mainly reflects accumulated fiscal deficits. As it turns out, though, it isn’t true at all. As the next figure shows, historically there is no relationship between changes in the state-local debt ratio and the state-local fiscal balance. Here, the vertical axis shows the change in the ratio of aggregate state and local debt to GDP over the year. 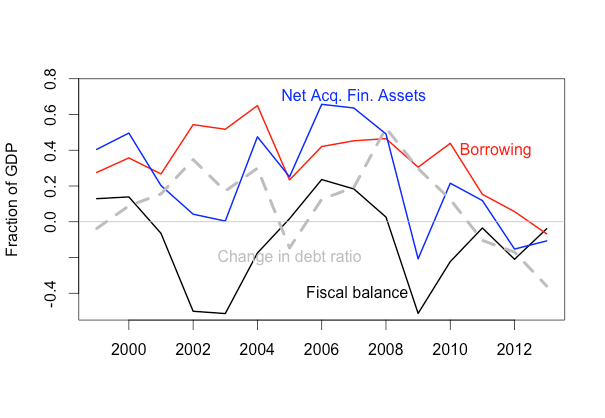 The horizontal axis shows the aggregate fiscal balance, with surpluses positive and deficits negative. So for instance, in 2009 the debt ratio increased by about one point, while state and local governments ran an aggregate budget deficit of close to 6 percent of GDP. If changes in the debt ratio mainly reflected fiscal deficits, we would expect most of the points to fall along a line sloping down from upper left to lower right. They really don’t. Yes, 2009 has both very large deficits and a large rise in the debt ratio; but 2007 has the largest aggregate surpluses, and the debt ratio rose by almost as much. Eyeballing the figure you might see a weak negative relationship; but in this case your eyeballs are fooling you. In fact, the correlation is positive. A regression of the change in on debt on the fiscal balance yields a coefficient of positive 0.11, significant at the 5 percent level. As I’ll discuss later, I’m not sure a regression is a good tool for this job. But it is good enough to answer the question, “Is state and local debt mainly the result of past deficits?” with a definite No. How can state and local fiscal balances vary without changing the sector’s debt? The key thing to recognize about state and local government balance sheets is that they also have large financial asset positions. In the aggregate, the sector’s net financial wealth is positive; unlike the federal government, state and local governments are net creditors, not net borrowers, in financial markets. As of 2013, the sector as a whole had total debt of 18 percent of GDP, and financial assets of 34 percent of GDP. As the following figures show, the long-term rise in state and local assets is much bigger than the rise in debt. Now it is true that most of these assets are held in pension funds, rather than directly. But a lot of them are not. In fact, for state governments — though not for the state-local sector as a whole — even nontrust assets exceed total debt. And whether or not you want to attribute pension assets to the sponsoring government, contributions to pension funds are important margin on which state budgets adjust. As the final figure shows, since the mid 1990s the aggregate financial assets of state-local government have exceeded aggregate debt in every single state. (Alaska, with government net financial wealth in excess of 100 percent of gross state product, is off the top of the chart, as is Wyoming.) This is a change from the 1950s and 1960s, when positive and negative net positions were about equally common. Nationally, the net credit position of state and local governments was equal to 16 percent of GDP in 2013, down from over 20 percent in 2007. 1. To the extent that state and local governments run deficits in recessions, they are can be financed by reducing net acquisition of assets rather than by issuing more debt. And historically it seems that this is how they mostly are financed, especially in recent cycles. So if we are interested in whether state and local budgets behave procyclically or anticyclically, the degree of flexibility these governments have on the asset side is going to be a key factor. 2. Some large part of the long-term increase in state and local debt can be attributed to increased net acquisition of assets. This is especially notable in the 1980s, when there were simultaneous rises in both state debt and state financial assets. And changes in assets are strongly correlated across states. I.e. the states that increase their debt the most in a given year, tend to also be the ones that increased their assets the most — in some periods, higher debt is actually associated with a shift toward a net creditor position. 3. Low interest rates are not so clear an argument for increased infrastructure spending as people often assume, given that little of this spending currently happens at the federal level. Yes, an individual project may still look more cost-effective, but set against that is the pressure to increase trust fund contributions. 4. If state and local governments face financial constraints on current spending, these are at least as likely to reflect the terms on which they must prefund future expenses as the terms on which they can borrow. The second point is the key one for my larger argument. Debt is part of a financial system that evolves independently of the system comprising “real” income and expenditure. They connect with each other, but they don’t correspond to each other. The case of state and local governments is somewhat different from households and the federal government — for the latter two, changes in interest rates play a major role in the evolution of debt ratios (along with changing default rates for households), while net acquisition of financial assets is not important for the federal government. But in all cases, purely financial factors play a major role in the evolution of debt ratios, along with changes in nominal income growth rates, which explain about a third of the variation in state-local debt ratios over time. And in all cases the divergence between the real and financial variables is especially visible in the 1980s. With respect to state and local governments specifically, point 4 may be the most interesting one. Why do state and local governments hold so much bigger asset positions than they used to? What is the argument for prefunding pension benefits and similar future expenses, rather than meeting them on a pay-as-you-go basis? And how do those arguments change if we think the current regime of low interest rates is likely to persist indefinitely? It’s not obvious to me that either public employees or public employers are better off with funded pensions. Unlike in the private sector, public employees don’t need insurance against outliving their employer. It’s not obvious why governments should hold reserves against future pension payments but not against other equally large, equally predictable future payments. Nor is it obvious how much protection funded pensions offer against benefit cuts. And if interest rates remain lower than growth rates, prefunding pensions is actually more expensive than treating them as a current expense. I see lots of discussion about how state and local government funds should be managed, but does anyone ask whether they should hold these big funds at all? In any case, given the very large asset positions of state and local governments, and the large cyclical and secular variation in net acquisition of assets, it’s clear that we shouldn’t imagine there’s any connection between sate and local debt and state and local fiscal positions. And we shouldn’t assume that the main financial problem faced by state and local governments is the terms they can borrow on. Most of the action is on the asset side. My critique of Piketty comes from the same place. All data in this post comes from the Census of Governments. This is true of economic theory obviously, but it’s also true of a lot of empirical work. When Gabriel Chodorow-Reich was hired at Harvard a few years ago, for instance, his job market paper was an empirical study of credit constraints on business borrowers that ignored investment and treated credit as an input into current production. For households, nearly 70 percent of debt is accounted for by mortgages, with auto loans and student debt accounting for another 10 percent each. (Admittedly, spending in the latter two categories is counted as consumption the national accounts; but functionally, cars and diplomas are assets.) Less than 10 percent of household debt looks like consumption loans. This is different from the number you will find in the national accounts. The main reasons for the difference are, first, that the Census works on a strict cashflow basis, and, second, that it consolidates pension and other trust funds with the sponsoring government. (See here.) This means that if a pension fund’s benefit payments exceed its income in a given year, that contributes to the deficit of the sponsoring government in the Census data, but not in the national accounts. This is what’s responsible for the very large deficits reported for 2009. If we are interested in credit-market debt the Census approach seems preferable, but there are some tricky questions for sure. All this will be discussed in more detail in the paper I’m writing on state and local balance sheets.